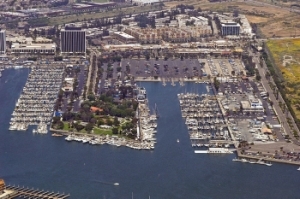 MARINA DEL REY—An outpouring of frustration and incredulity emanated from the community over the designed Visioning Plan during a meeting of the Small Craft Harbor Commission May 28 at Burton Chace Park’s community building. With more than 150 residents in attendance, about 40 members of the community, including boaters, business owners and activists, expressed their dissatisfaction with the Department of Regional Planning’s presentation of the Marina del Rey Visioning process. Gina Natoli, Los Angeles County’s Supervising Regional Planner, said the proposal for the land, which is regulated and managed by the Department of Regional Planning, will be spread out over a 10 to 15 year period. Outlining the department’s plan, she said the project’s main goals are to develop activity districts, improve mobility and directional signage, engage the image of the marina, gain recreation opportunities and provide gathering spaces. “This is all to create that vibrant, sustainable, pedestrian, visitor, business-friendly marina that we’ve heard people want to see,” she said. The suggestion to move the boat launch and storage facility from its current location on parcels 49M/R/S to the area near Fisherman’s Village caused the greatest stir. The current boat launch would then become a visitor-serving commercial retail destination. Michael Tripp of the Regional Planning Department introduced six conceptual boat launch designs, which had attendees in uproar over safety issues regarding wind direction. The public agreed that the current launch ramp location is the best and most practical spot. The anticipated Visioning Plan, which was first proposed by the county in April 2013, highlights four separate districts, including a residential district, Marina Beach, Visitor’s Row and Boater’s Way. Along with a new boat launch ramp, it calls for the addition of a new retail center and improvements in traffic flow. The department claimed past meetings with the public had taken place on several occasions in the 13 months since the statement’s inception, with county staff hearing ideas and concerns about the process’ future developments. Outreach, according to Natoli, also included telephone interviews, workshops and stakeholder interviews. According to Natoli, implementation of the venture is projected to occur over both the short and long-term and will include a series of decisions based on individual projects, lease negotiations and policy changes. Next steps include revising the statement as needed, obtaining a recommendation from the Regional Planning Commission for their approval, and then receiving approval from the Board of Supervisors. The commission, however, unanimously voted for a resolution against the department’s proposal. In the motion, they requested the department’s staff establish a strategic recreational boating plan, to have Fisherman’s Village stay in its current location, to maintain the existing boat launch ramp and to emphasize a boating-first policy in the marina. Plinio Garcia, co-owner of IndyPlush in Fisherman’s Village, introduced 356 signatures he complied during a 10-day period to halt the deconstruction of the village. The Small Craft Harbor Commission’s next meeting is scheduled for June 11 at 10:30 a.m.